Hollywood’s videogame adaptations tend to pull over plot and characters, but leave behind structure and systems. It’s deemed more important that Rupert Friend should shave his head and wear a loud tie than a Hitman film incorporates the puzzle box feel that makes the series popular enough to be worth adapting. Want to play Edge of Tomorrow by another name? Try one of the best FPS games on PC. In that sense, the most faithful videogame movie ever made isn’t tied to any gaming license at all, but a Japanese novel – Hiroshi Sakurazaka’s All You Need is Kill. In the cinemas it was called Edge of Tomorrow, and by the DVD release they’d settled on a name that captured the essence: Live. Die. Repeat. Tom Cruise is Bill Cage. He wears a US military uniform and takes the title of Major, but like any new player donning the guise of BJ Blazkowicz or Gordon Freeman for the first time, he’s a fraud incapable of living up to his own costume. A former advertising executive charged with handling the PR of an unpopular war against alien invaders who have taken Europe, he can’t stand the sight of blood. He certainly doesn’t know the controls. Forced onto the frontlines in France, he stumbles ashore to meet his own personal D-Day. In a perfect moment on palpable terror, Cage is reduced to flicking through the language options on his weaponised suit. The aliens themselves – mimics – are whirligigs made of a hundred arms, moving at incredible speeds and displaying no helpful weak spots. The odds are staggeringly unfair and Cage is of course killed, face corroded by corrosive gloop. Wibbly-wobbly, timey-wimey sci-fi convenience sees him wake up back at barracks, however, and as death loses its terror, it opens up new potential for experimentation. The day of the assault is a level Cage has played before – one in which he hears his Captain say the same lines, but has the foreknowledge to influence when and how they’re said. “Through readiness and discipline we are masters of our fate,” intones the CO. It’s the sort of message you might find burned into the ground in Dark Souls 3. From then on Cage learns through brutal trial and error. The comrade who comes to battle stark-naked beneath his suit can’t be warned about the ship that comes crashing down on his head – only forcibly pushed out of the way. If Cage jogs full pelt up the beach, he’ll be hit and killed by a passing jeep. With each death he becomes more practiced, knowing when to pause and where to fire. Before long Cage’s knowledge has overtaken that of the audience, and it becomes apparent he’s acting on information gleaned through previous playthroughs we haven’t been privy to. Soon enough he’s the only one on the beach who knows what’s happening – a clairvoyant with an assault rifle. Co-star Emily Blunt’s character, Rita Vrataski, has been through the same process – killing hundreds of mimics on her first day of battle, with limited training. Her ability is credited to a Crysis-style super suit – but as in so many games, success lies in repetition. If Cage is to finish the level he’s stuck on, Vrataski implores, he needs to git gud. “You don’t have time to think; remember,” she says. Since it’s the same day Cage replays, he’s not building muscle mass but muscle memory. As he feels out a route up the beachhead, he teaches a now-mortal Vrataski the steps: strafe left, kill mimic, strafe right. Run 30 paces northwest, then duck at the top of the trench. He becomes the ultimate guide writer; the man with all the Konami codes. Dying in the same scenario over and over, Cage does as all players do – he becomes impatient. He skips dialogue, telling the CO his own lines before he’s able to get them out. He jogs ahead in an attempt to speed through a scripted sequence he knows all too well. He cuts his own cord in the dropship so that he can hit the beach quicker, knowing from experience that he won’t miss anything by hanging around. It’s a brand of frustration familiar to anybody who’s repeatedly fallen to the same boss and reloaded a checkpoint half a level earlier. Eventually Cage has a favoured loadout (three extra clips of 556, eight grenades, two batteries, no helmet), and comes to understand which moves are important and which don’t change the outcome. He watches impassively as the dropship falls on his squadmate, knowing how to save him but knowing it doesn’t matter. Trapped in a sanity-threatening loop, his wearied demeanour is that of somebody who has all the moves down pat but can’t get them all off in one attempt, believing it to be impossible. Naturally though, as it always does in games like these, the impossible comes to pass and Cage gets far further than he expected he could. What occurs once he leaves the beach is fascinating: his skills, a routine learned for a very particular performance, turn out to be transferable in the improvisational wild. A thousand cruel resets have highlighted every failure, and we’re now watching a virtuoso at work. 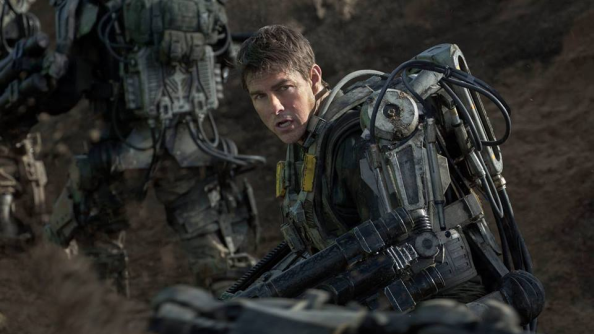 Edge of Tomorrow is a non-interactive shooter. But there are glimpses of other game types within. “When the Chinese delegation comes out we pick up the pace,” Cage rehearses when required to break into London’s Whitehall. “This guy with the yellow armband always recognises you, so just keep your head down, stay to my right”. With patrol routes and room placements memorised, his dialogue becomes indistinguishable from the internal monologue of a Hitman player. To up the tension in its final act, Edge of Tomorrow reaches for the most stressful tool in gaming’s arsenal: permadeath. After a blood transfusion, Cage loses his power to reset the day – and crucially, knows he’s lost it. Suddenly every move is imbued with finality. 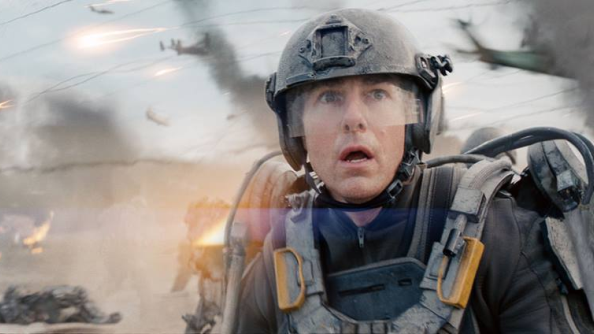 Having stripped death of its power, Edge of Tomorrow restores it, to sweaty-palmed effect. The ending is a bit naff, but honestly, that just seals the analogy. Games have bad endings – even the ones that are movies. 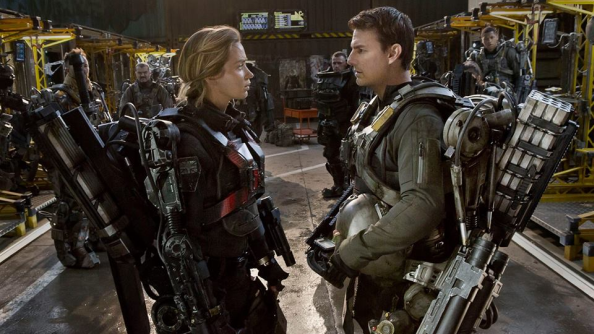 There’s an Edge of Tomorrow 2 happening. Fittingly, it’s a repeat: Doug Liman returns to direct, while Tom Cruise and his favoured script doctor, Christopher McQuarrie, are back in their original roles. It’s the same setup, set to play out with different results. Having learned the lessons of a reportedly gruelling shoot the first time around, let’s hope they can now do it again: more efficiently, with flair, getting just a little further than before.